With the help of our experts, we offer an exclusive range of Vishnu Lakshmi Statues to our clients. We provide this statue in numerous avatars, styles and sizes that meet the individual requirement of our clients. We use the best quality marble and stones for crafting our range and acknowledged for the smooth finishing and quality. 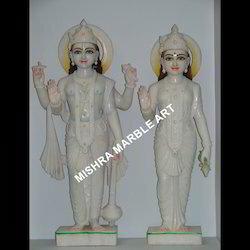 We offer an exclusive range of Vishnu Laxmi Ji In White Marble Statue. These are crafted using high quality pristine white marble stones and are suitable for deploying at the place of worship. In this statue, both Vishnu and Laxmi are in standing position. Our range is carved by our sculptors and artisans and with the help of hand tools and special purpose machines. With the help of our experts, we offer an exclusive range of Vishnu Statues to our clients. We provide this statue in numerous avatars, styles and sizes that meet the individual requirement of our clients. We use the best quality marble and stones for crafting our range and acknowledged for the smooth finishing and quality. Looking for Vishnu Lakshmi Statues Satyanarayan ?